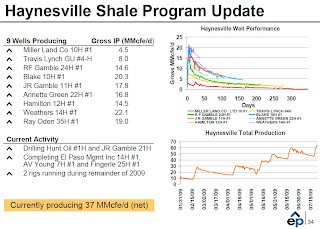 El Paso's E&P unit has been quietly busy in the Haynesville Shale. 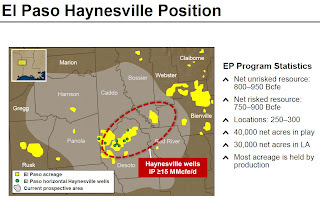 As the slide below summarizes, the company has more than 40,000 net acres in the play, mostly in Louisiana and much of it held by production, so the company is not looking down the barrel of a ticking clock (bad metaphor, sorry). On the map below, they feel that the best wells are being drilled in the red oval. Given the fact that El Paso has a big chunk of leased land inside the oval in DeSoto Parish, the company is very happy with its prospects in the Haynesville Play. The company has completed nine wells in the play and is operating two rigs. The slide below shows the IPs for the nine wells and decline curves for eight of the nine. El Paso is drilling two more wells and in the process of completing three. El Paso, like other companies in the play has seen its efficiencies improve greatly. 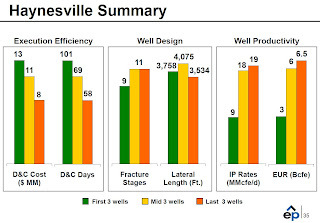 The slide below shows the improvements in efficiencies and productivity between the first, middle and last third of the nine wells. The middle set of bars shows the number of laterals and their lengths. Interestingly, the last three wells, the most productive of the bunch, are using 11 laterals (the same as the middle third) but over a shorter horizontal length. Average cost per well has decreased from $13 million to $7.5 million and cycle time has dropped from 100 days to 60 days.